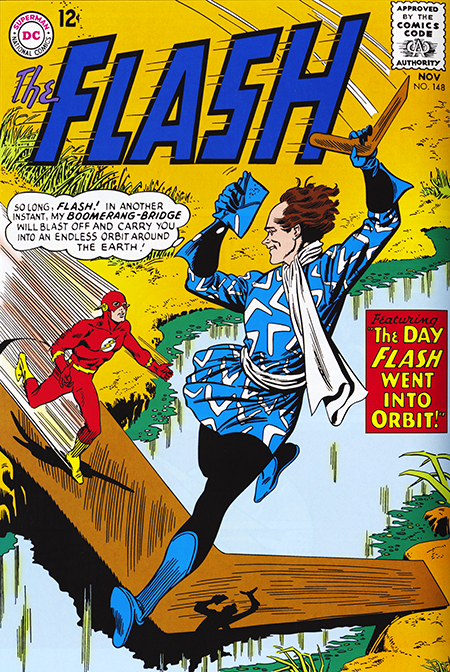 “The Day Flash went into Orbit” pretty much says it all. Captain Boomerang is on the loose again and he plans to use a boomerang to shoot the Flash into orbit. This trope was beginning to wear just a little thin by this point and I don’t think it was the writer John Broome’s fault. He obviously had to deal with a cover idea from his editor Julie “Be original” Schwartz who was failing to heed his own advice at this point. This time the boomerang isn’t on a catapult, or rocket propelled, but is simple laying on the ground one second and launching itself into space the next. Broome dutifully worked the cover in by slapping the sequence onto the end of a clever little story of his own. A vengeful former cellmate go the good Captain decides to get even with him when they are both out of prison by feeding him crime targets as he sleeps and then beating him to the punch each time. It was a nice little mystery for CB to solve but he never really gets the chance because he has to go try to launch the Flash into space for the umpteenth time. But it’s hard to be grumpy about it when you look at that beautiful Infantino/Anderson art which always went a long way towards smoothing out any rough spots for me. The second story “The Doorway to the Unknown!”, about a dead man who appears to the Flash in an effort to save an innocent man, would receive a lot of comment from Flash readers in the lettercols in future issues. This sort of fantasy element was different to the Flash for sure. Julie’s books were generally grounded in a scientific reality no matter how fantastic the science became. I think the response the story got was due more to its uniqueness in the context of the Flash than anything else because it it didn’t amount to much more than a very average Twilight Zone episode. The ending where the writer invokes the invincible spirit of man to get you to believe in the story leaves you with the feeling that he didn’t really believe it himself.